The Columbus Dispatch ran a story this past weekend about the school funding cuts that will be implemented in the first biennial State budget submitted by Gov. Kasich. While our Federal Government might not be so good at keeping secrets (e.g. WikiLeaks), the Kasich Administration has been completely opaque about what they intend to do about this $8-10 billion budget gap hanging over our State. 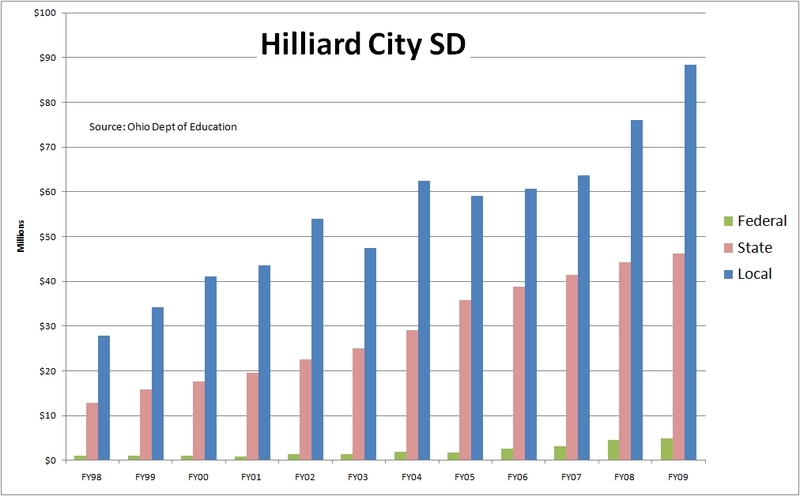 However, this story gave a little hint of what I've believed for a long time - Hilliard City Schools and similar suburban districts are likely to take the brunt of the State funding cuts. 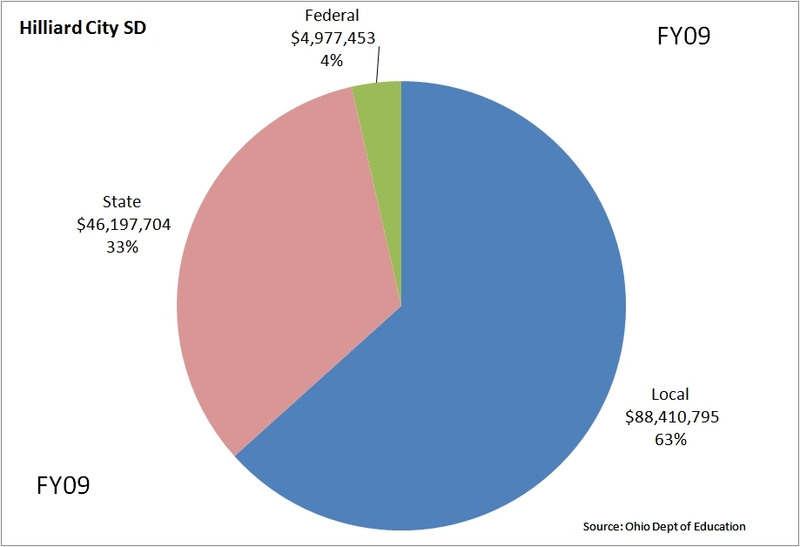 As you can see from the following chart, Hilliard Schools receives 33% of its funding, or $46 million, from the State of Ohio. ...although this is partially an artifact of the phase-out of Personal Property Tax revenue as a Local source and being replaced by a temporary reimbursement by the State. The one-time money granted as part of the Federal stimulus programs also was fed to school districts via the State. Regardless of these aberrations, the story here is Rep. John Carey, vice chairman of the House Finance Committee, saying that "there is growing support of a tiered cut." So what does that mean? Ohio's school funding system is, and has been for decades, based on one key principle: that the pool of State dollars budgeted for school funding should be passed out in hunks inversely proportional to the affluence of a particular school district. In other words, the people and businesses in affluent districts pay boatloads of State income (and other) taxes, but most of that money will be used to fund the poorer districts of the State. I don't have a huge philosophical problem with that. Some might argue that there should be no State income taxes (there wasn't until the 1970s), and that communities should have to provide the entire funding necessary to operate a public system, without any help from others. That position ignores two key points: a) the Ohio Constitution requires the state government to take what action is necessary so that every child in Ohio has the opportunity for a "thorough and efficient education;" and, b) the school district boundaries drawn 100 years ago have created opportunities for regions to fracture into communities of "haves" and "haves-not" that were not anticipated when the public school system was conceived. Because of that, we tend to have urban districts with high commercial property values and high poverty levels, and suburban districts lacking significant commercial revenue sources, but the ability to fund their districts completely with local resources. Why do I say "fund their districts completely?" 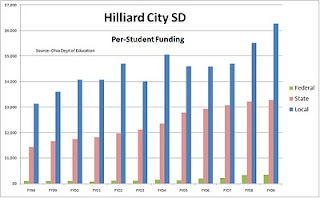 Because if you take Hilliard for example, we - according to a report generated by Larry Wolpert when he was our State Representative - pay out two dollars of income taxes for every dollar of school funding we receive back. If that ratio is still true today, then we pay out around $70 million in State income taxes in order to get back $35 million in State funding. It would be worse - Dublin gets back about 12 cents on the dollar. We can't put too much weight on this analysis. After all, there are others important ways in which our State income tax dollars are spent - notably for Medicaid and to run our prison systems. But you get the point. If you combine what we pay in State income tax and local property tax, it is more than sufficient to run our schools. As a friend once said, we pay enough taxes to run our school district plus a couple of the little ones. That's not going to end with the Kasich administration. Instead, we need to prepare ourselves for the likelihood that we'll bear a disproportionate share of the cuts, simply because we are seen to have the capacity to do so. And it's simple for the state lawmakers to implement, all they have to do is tweak the Educational Challenge Factors, which are encoded into the law as ORC 3306.051 (an easier to read list of the ECFs is available here). These factors range from about 0.7 to 1.7, and they are used as a scaling factor in the PASS calculation used to determine how much State funding a district receives. The smaller the ECF, the smaller the fraction of the calculated funding a district will be granted. Our ECF is 0.985085. The state lawmakers will also likely have to tinker with what is often called "the Guarantee." In the PASS calculation, it is called "Support Provided During Transition to Revised Funding Model." What that really means is that anytime the lawmakers change the school funding system, there are winners and losers. This "Guarantee" softens the blow for the losers, which makes such changes easier to get passed in the General Assembly. The Guarantee is more of an ax compared to the ECF's scalpel, but both will be used. And we'll take the hit. The current Five Year Forecast is built on the assumption that our hit will be 10%. The size of the levy we just voted to put on the ballot was passed in part because of that assumption. If we take a bigger hit - and I fear we will - our Forecast goes out the window, and we'll have to scramble to figure out how to bring spending into alignment with even less revenue. I would have preferred to have used a larger temporary levy to give us some wiggle room, but we've ended up with a Permanent Levy of 6.9 mills on the ballot. Between now the May election, we'll find out what the Governor and General Assembly have in store for us. Let's hope the 10% assumption is in the ballpark. I have written a number of articles over the years about the perilous fiscal condition of the State Teachers Retirement System, the organization which provides retirement benefits to the teachers and other certified employees (including Administrators who are former teachers) of Ohio's school districts. This week, as reported in The Columbus Dispatch, the governing Board of STRS voted 7-3 to implement adjustments to both the contributions required and benefits provided, in hope of preserving the financial integrity of the system. This is not the final step in the process - the decision of the STRS Board now goes to the General Assembly, who will use the Board's resolution as the basis for drafting updates to the laws which control STRS. From there, the proposed law goes to the Governor for his action. Governor Kasich had made it clear that he would veto any legislation which forced greater contribution from the employers - which are the local School Boards. The current contribution scheme requires the employee to contribute 10% of salary to STRS, and the employer - the taxpayers - to contribute another 14%. Under the proposed plan, the employee share would gradually increase to 13% by 2014, but there would be no increase in the taxpayer percentage. Some argue that the employer contribution to STRS has not increased for years. This is a partial truth. 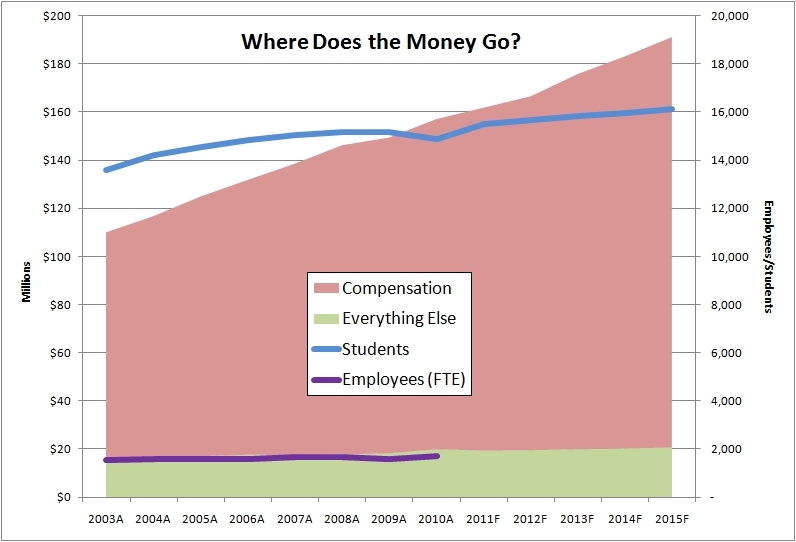 While the percentage of the employees salaries contributed by the taxpayers might not have increased from 14% for many years, the majority of our teachers and other certified staff have been receiving annual increases of more than 7% for the past decade, and the taxpayer share, in dollars, of the STRS contribution has increased at the same rate. The STRS Board made some other tough choices as well. Currently, the STRS rules allows a teacher to retire with unreduced benefits at 30 years of service. Under the new rules, which phase in between 2017 and 2023, a teacher will need to be at least 60 years old and have 35 years of experience to receive unreduced benefits. But currently a teacher who retires with 35 years of service receives a kicker that makes this percentage 88%. With Hilliard's current pay schedule, a teacher retiring with 35 years of service with a Final Average Salary of $90,363 would receive an annual pension of $80,423* for the remainder of life. In what perhaps is a preview of the issues facing Social Security (which by the way the teachers neither pay into nor receive benefits from), decisions had to made about how to apportion the costs of fixing STRS between those who are already retired, and those who are still working. Each group feels they are being asked to sacrifice for the benefit of the other. The following cartoon is from the blog of Kathie Bracy, an STRS retiree and activist. The final decision will have less to do with what is fair or logical than it does which group carries more political clout in the Statehouse. As with every other area of American politics, those with money and votes always win in the end. So who won in this case - the retired teachers who are more likely to show up to vote, or the active teachers who can funnel tons of money into campaign coffers via the Ohio Education Association? We may not know for a few years, after all of the unintended consequences shake out (e.g. as many highly paid teachers retire, converting from major contributors to the system to its largest beneficiaries). But I do know that the taxpayers were not made party to the conflict, thanks to the stand taken by Gov. Kasich. It was their own investment decisions and benefits choices (e.g. the so-called '13th Paycheck') that got STRS into this mess, and the taxpayers should not be expected to bail them out. * Note: these numbers are accurate to the best of my knowledge. However, the only authoritative source of retirement information is the State Teachers Retirement System. Consult with STRS before making any retirement decisions. Here is the comment I read into the record at tonight's School Board meeting. As I said would be the case, I voted in favor of presenting this levy to the voters in the May election. First, I wanted to say thanks to President Maggied for calling the special Board meeting last Friday, and thanks as well to the other Board members and Administrators for participating. I think we got some important information on the table that I hope will be helpful as we move forward. And as always, thanks to the community members who came to observe. 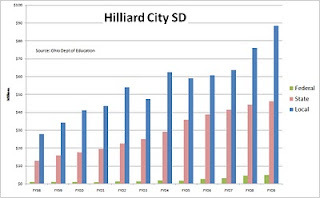 In the fourteen years from 1976 to 1990, the Hilliard School district asked the community for additional funding only twice, raising our school taxes during that period at an annual rate of 2%, a pace that would cause our school tax to double once every 30 years. Since then, school levies have been coming at ever-shortening intervals – five years, then four, and this time only three. With this levy, we will be entering the next phase – putting a levy on the ballot that will almost certainly have to be followed by another in only two years if there is not a significant reduction in the rate of our spending growth. Since 1990, our school taxes have been growing at an annual rate of 7% - a pace which will cause them to double every ten years. I ask for bold leadership on the part of the administrators and union officers, and ask the entire team of teachers, staff and administrators to have empathy for the people of our community, many of whom are struggling to stay afloat. There are 700 property owners behind in their taxes in our district. Approximately 150 properties have been brought up for Sheriff’s sale so far this school year. It is my belief that for this levy to pass, the Administration and the unions will need to be forthcoming with ideas for how we should collectively address this issue of spending growth at a time when we are seeing declining revenue from all funding sources. The answer cannot be to keep asking the homeowners and business owners of our community to pass levies with ever increasing frequency. It is not business as usual this time around. After the School Board meeting, I had a chance to meet with the Darby Athletic Boosters, and present to them much the same information I outlined in the previous article. My only objective is to teach folks how we came to be in this position, to ask for their help in finding a solution, and to request that they pass what they have learned on to their neighbors. Regardless of one's philosophical leanings, we have a real money problem to solve - whether or not this levy passes - and we need people to help us find real solutions, not spout opinions without any basis in fact. 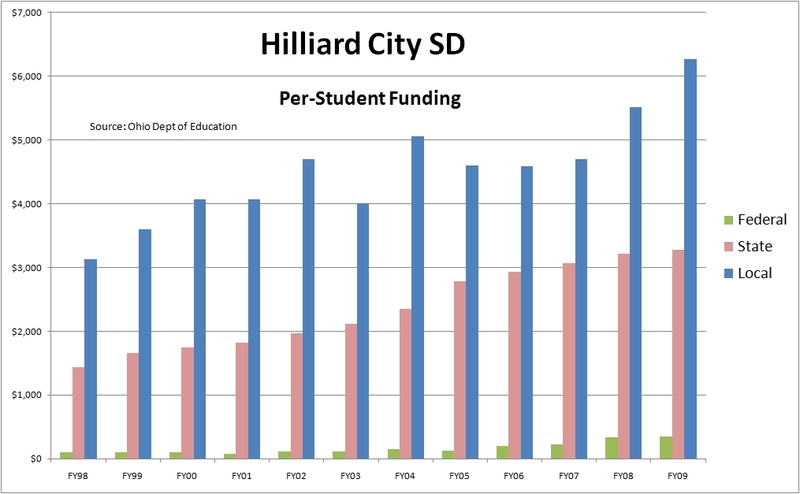 Additional note: Contrary to the story reported in the Hilliard Northwest News, the School Board did not spend months deciding on a millage amount. As I noted in my blog article of Dec 17, there was still much to discuss relative to this levy, and it was for this reason that I voted against the Resolution of Necessity during the January 10, 2011 meeting of the School Board. 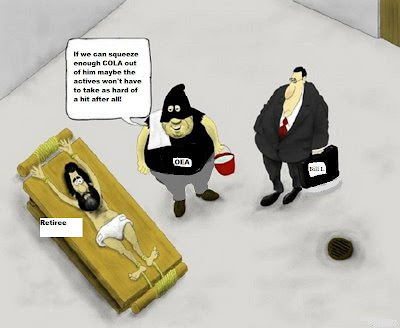 Until our special meeting on January 21, 2011, 6.9 mills was at best a strawman, in my opinion. I was certainly not involved in any discussions of this amount prior to January 10, 2011. The agenda for the Jan 24, 2011 regular meeting of the School Board includes a resolution to direct the Franklin County Board of Elections to place a levy issue before the voters for the May 2011 election. As I wrote earlier, I voted against the Resolution of Necessity when it came up at the Jan 10 meeting, and explained that I did so because I felt there had been insufficient discussion of our financial picture - not enough due diligence - prior to that vote. I had hoped the Board would postpone the vote on the Resolution of Necessity for a few days until that discussion could be had. The Board instead chose to go ahead with the vote, but agreed to schedule a special meeting to have the discussion I requested. That meeting took place yesterday. A 6.9 mill levy if passed this May will still not provide sufficient money to fully fund the assumptions given in the latest Five Year Forecast, accepted by the Board in Oct 2010. We are spending more than we take in now, and will continue to do so even if this levy passes. All that will be achieved with this levy is to slow the rate in which we are draining our cash reserves. Therefore, if the spending plan is not changed, another levy will be needed no later than two years from now. If we continue to increase our rate of spending at this rate, our property taxes will have to double every 10 years to keep up (see chart below). As I have been saying for years, and am now joined by the Audit & Accountability Committee, our rate of spending increases cannot be materially changed without dealing with the cost of compensation of benefits, which is projected to consume 90% of our budget by FY15. Our community needs to understand that it is unlikely that our Board, in its current composition, will ever fully agree on the actions needed to find a solution to our fiscal challenges. We simply see some things differently, and the folks who voted us into office supposedly know that. I see our primary fiscal issue being the compensation and benefits structure for the teachers, staff and administrators. I seek to recalibrate our personnel spending practices in order to dramatically slow down the rate in which these costs are growing. My pitch today was designed to draw attention to this area, and hopefully convince the other Board members that this is where we need to concentrate our efforts. Not everyone on the Board agrees with me on this. Nonetheless, they are the duly elected representatives of the people of our district. I may not agree with their viewpoint, but I respect them for being true to their philosophy and faithful to the people who elected them. I hope they respect me for the same reason. There was agreement that we need to look more deeply into a couple of areas. One was a request by Dave Lundregan that the Treasurer prepare some additional scenarios built on a variety of changes to his current assumptions. Things like changes in the compensation structure, but also a variety of other factors. Another is that we talk to experts on early retirement incentive programs to see if our current configuration of employees lends itself to a buyout program that makes economic sense for both the employees and the District. Unless something quite unforeseen happens between now and Monday evening, I will be voting in favor of putting a 6.9 mill levy question to the voters in May. I am satisfied that the whole Board understands the challenges before us, even if we disagree on the solutions. It is now time for the public to have its say. Some will vote 'yes' without any regard to the financial situation. They may be employees of the district, or the friends and family of employees. They may be parents of school age kids who fear having the school district come apart before their kids graduate. They may be property owners who worry about a further erosion of their home values if the school district falls into fiscal crisis. Others will similarly vote 'no' without reasoned analysis. Maybe they're just tired of their taxes going up. Without question, every time property taxes are raised, there is hardship created, especially for the retired senior citizens and now the large number of unemployed. Others who could easily absorb the tax increase will vote 'no' on philosophical grounds, unswayed by any arguments to the contrary. My hope is that the remaining voters will use this levy question to engage in the dialog about where their school district is headed. If you think the school district is spending too much money on something, please come forward at a School Board meeting and say so. A 'no' on the ballot is nowhere near as effective as your direct feedback to the School Board. Just don't make it about lights left on at night or empty school buses that pass your house. That lemon has been squeezed pretty hard over the past several years, and there's not a lot left there. I appreciate very much that the other members of our School Board agreed to hold a working session to further discuss our levy options. A copy of the official meeting notice is provided at the bottom of this message. I have prepared a set of financial scenarios (with notes to the scenarios) and sent them to the Board members in preparation for our discussion. These scenarios are intended to help us look a couple of moves ahead - beyond just the immediate situation - and to help discover the bounds of reasonable decisions. I have long said that when a levy is being planned, several other parameters beyond just the levy size need to be considered - because they are all interrelated. For example, assuming any particular spending plan, the smaller the size of the first levy, the larger must be the second levy. The reverse is also true - the larger the first levy, the smaller the second can be. Likewise, the larger the first levy, the longer the interval can be until the next levy; and the smaller the first levy, the shorter the interval must be. The Board also needs to pay attention to the cash balance. It's a "hard deck" as Navy pilots like to say - we can't let the cash balance go below zero. Most would say it's prudent to leave a little margin for error. Board policy says our cash reserve should be 10% of the annual operating budget, which would make it about $18 million at our current spending rate. However, having spent a big chunk of this reserve in order to wait an extra year before putting a levy on the ballot - it would take a pretty good sized levy to get us back to 10%. Several of the scenarios I've prepared examine what it would take to keep the reserve at $5 million, or about the size of one payroll. That's not a lot of wiggle room. And finally, a look at these scenarios makes it clear that the spending plan has to change. There is simply no combination of rational levy sizes and intervals which can support the spending plan currently dialed into the Five Year Forecast. The Board needs to dig into this soon, and examine another set of scenarios for lower rates of spending growth - lower than the 4.25% compound annual growth rate built into the current Forecast. I realize that this special meeting has been scheduled during working hours for most of us, and there is no public participation scheduled, but I still hope folks will come to observe how their School Board makes these important decisions. Notice is hereby given; there will be a SPECIAL meeting of the Board of Education of the Hilliard City School District on FRIDAY, JANUARY 21, 2011 at 3:00 P.M. located at the Hilliard City School District Administration Building, 5323 Cemetery Road, Hilliard, Ohio. The meeting will be held in regular session to discuss the potential operating levy and any other business that may be lawfully considered. In the previous article, I noted that there was a question whether a School Board could submit more than one Resolution of Necessity to the County Auditor. The answer is Yes - a School Board can submit as many resolutions as it wishes. In fact, some School Boards choose to submit several resolutions at the same time, each with different levy amount, so that they have a opportunity to use that information to make their final determination of the levy amount to put on the ballot. The County Auditor turns these Resolutions around pretty quickly - it's not a hard calculation for them after all. Treasurer Brian Wilson told me that we had our response back from the County Auditor by Thursday of the same week we submitted it. It would have been good to know these things when I made my motion at last week's Board Meeting to postpone a decision until we could have more detailed discussions, as it might have least received a second - since the reason expressed for withdrawing the second was a concern that action had to be taken that night in order to leave enough time for the County Auditor to perform their required actions. At its meeting last night, the School Board voted 4-1, with me as the sole NO vote, to submit a Resolution of Necessity to the County Auditor, citing the need for a 6.9 mill levy to be placed on the May ballot. I made a subordinate motion that the Board postpone action on this Resolution until further due diligence could be completed. My motion died for the lack of a second. However, there was agreement to hold a special meeting as soon as possible to further discuss this levy. The presumption is that there is still an opportunity to change the levy structure and/or amount prior to submitting the next required resolution to the Board of Election requesting that the levy issue be placed on the May ballot. I've asked Treasurer Brian Wilson to check with the County Auditor and/or our Board's legal counsel to confirm that this is true, and to withhold submission of the Resolution of Necessity to the County Auditor until we get that answer. It could be that this is a one-shot process, and that a School Board gets to submit only one Resolution of Necessity each election cycle. We don't want to learn that after the Resolution has already been submitted. Thank you to the many members of the community who came out to the School Board meeting last night. Your engagement in this process is crucial and appreciated. Please continue to communicate your feelings to the members of the School Board as we continue through this process. On the agenda for the School Board meeting, to be held at 7pm, Monday January 10, 2011, at Hoffman Trails Elementary, is the Resolution of Necessity representing the first formal step toward putting an operating levy on the May ballot. The Resolution of Necessity is required by Ohio law (5705.03). Its purpose is to formally ask the County Auditor to certify the total tax valuation of property in the school district as well as the amount of money that would be generated by a specified number of mills (the School Board can also ask the reverse: how many mills are required to generate a certain amount of revenue). The language of this resolution - presented as item F1 in the agenda - specifies that the County Auditor will be asked to certify the amount of revenue that will be raised by a 6.9 mill levy. My estimate is that the County Auditor will come back with a number on the order of $15.4 million per year. 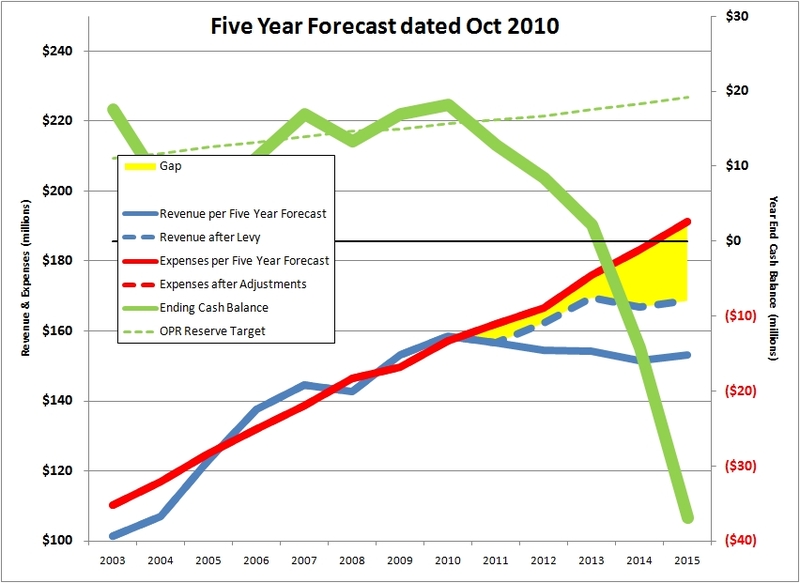 However this estimate is based on the assumptions used by Treasurer Brian Wilson in developing the current (Oct 2010) Five Year Forecast, where he said that during the 2011 county wide property revaluation, which County Auditors are directed by law to perform every six years, properties will be reduced in taxable value by about 8%. I have not yet heard what our County Auditor, Clarence Mingo, has decided in this regard. Section 4 of the Resolution language states: "This Board finds and determines that all formal actions of this Board and of any of its committees concerning and relating to the adoption of this resolution were taken, and that all deliberations of this Board and of any of its committees that resulted in such formal actions were held, in meetings open to the public, in compliance with the law." This is a certification that the School Board has complied with the provisions of Ohio's Sunshine Laws, which require the governing bodies of public entities to conduct their business (with few exceptions) in open meetings which may be observed by any member of the public. My concern at this point is that there has simply been no meaningful discussion about this levy. I was certainly not part of any discussion that caused 6.9 mills to be written into this resolution. Therefore, I take this number to be a placeholder, and expect that we as a School Board will have substantive discussion about this levy before a final amount is chosen, and written into the final Resolution of Necessity. I am fully prepared to vote in favor of a resolution that specifies a levy amount that is arrived at as the result of analysis of the financial data (more than just three bar charts showing estimates regarding how long it will be until we're out of cash again), meaningful debate, and reasonable compromise. I am not, however, prepared to vote in favor of any resolution for any levy amount unless much more due diligence is carried out. At 6.9 mills, we would be asking our community to permanently increase the collective tax burden by approximately $15.4 million per year (again, to be determined by the County Auditor), which will be a 8% increase in our property tax bills, and a 13% increase on just the school tax portion. For those familiar with Present Value calculations, a perpetual cash stream of $15.4 million/yr is equivalent to asking the people and businesses of our community to collectively write a check tomorrow for $350 million, using the latest yield on the 30-year US Treasury bond of 4.4% as the discount factor. It seems to me that before the School Board asks the community for that kind of money, we should have some pretty serious discussions about how the money is going to be used, what has to change in terms of programs and services, how much money we want to keep in our cash reserves to deal with unexpected events (i.e. if the State of Ohio really cuts back on our funding), how long it is projected to be until we need another levy, and how large that levy might need to be. 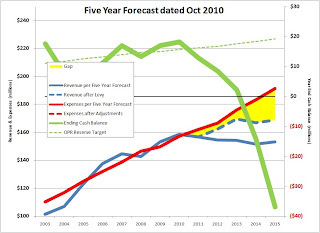 My modeling suggests that if a 6.9 mill levy is passed now, and spending is kept at the levels portrayed in the current version of the Five Year Forecast, then a 12.5 mill levy will be needed in 2013 in order not to run out of cash is FY14. And we need to talk strategically about compensation and benefits, which is rapidly approaching 90% of our annual budget. Quoting from the June 2010 report of the District's Audit & Accountability Committee: "The District... cannot make a significant impact on the budget without addressing the salary and benefits portion of the expenses... While it is important that the Administration continually watch all costs, compensation expense for Administrators, teachers and support staff is the only expenditure that "moves the needle." By law (ORC 5705.21, as cited in the resolution), this resolution must be passed "by a vote of two-thirds of all its members." Since our Board has five members, and two-thirds of five is 3.33..., this resolution must receive four votes in order to pass and be submitted to the County Auditor. Unless and until the substantive discussions I describe above take place, my vote will be NO on this resolution. Note: Although there is little change in the numbers, I found something else that needed to be corrected in the chart I developed to illustrate the impact of various levy amounts and intervals between levies. I failed to take into account that after the property revaluations in 2011, the dollar amount collected by any particular millage will diminish. Note that the so-called "HB920" protections will prevent the dollar amount of property tax we all pay now from being adjusted downward with the reduced value of our properties - it is only the incremental rate which will decrease. At the last meeting of the School Board, community member Mike Harrold used the Public Participation time to pitch the idea of using an Emergency Levy as the means to fund our school district over the next year or two. The Ohio Revised Code allows school boards to implement, with voter approval, a variety of revenue mechanisms. For quite a few years, the leaders of our school district have chosen to use Continuing Levies, sometimes called Permanent Levies. They are exactly what the name implies- a levy that never expires. A levy of 6 mills would cause a homeowner to pay $184 per year per $100,000 of current home value FOREVER. In contrast, an Emergency Levy is proposed for a fixed period of time of no more than five years. Then it goes away, unless the School Board and the voters decide to renew it. Our Treasurer, Brian Wilson, built the most recent Five Year Forecast with the assumption that our Foundation Aid would be 10% less in FY12 than in FY11 (the fiscal year we're in right now). It could easily be much worse. Our neighbors in Olentangy Local Schools have just built a new fiscal plan assuming a 30% decrease in State funding. Next year, we will be again negotiating with the unions representing the teachers and staff of our District. Meanwhile Governor-elect Kasich has said that he will be championing collective bargaining reform when he takes office, but hasn't given anyone a clue what he's thinking. How can we negotiate a multi-year agreement with the unions with this kind of uncertainty? 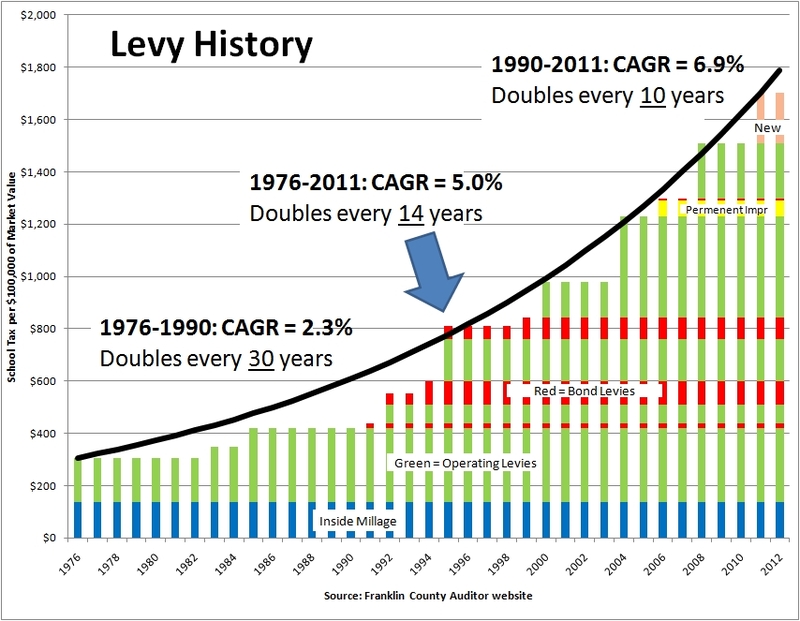 The Franklin County Auditor will be performing a Revaluation of all real estate in the county during 2011. These revaluations occur every six years, as directed by the Ohio Revised Code. We can be pretty confident that the County Auditor will reduce property values across the county, but we can't be sure how much. Mr. Wilson has baked an 8% decrease into the Forecast, but that may be conservative. The Delaware County Auditor decreased property values 10%. Many folks will be surprised that a reduction in our property valuations won't result in a commensurate reduction in our property taxes. The same mechanism that keeps our property taxes from increasing when real estate valuations are increased also keeps them from decreasing. So an 8% reduction in valuation will affect only the 12% of our property tax bill which is the so-called "inside millage," netting an overall reduction of about 1%. But going forward, the amount raised by 1 mill of new tax will be 8% less. Currently, 1 mill will raise about $2.4 million per year. If property values are decreased 8%, 1 mill will raise $2.2 million/yr. So it will take more mills to raise a specific amount of money. Given all these unknowns, and the fact that we have spent down our piggy bank to the point where we have no reserves (the current Five Year Forecast shows the FY12 year end cash balance to be zero), I think we may - in the short run - need well more than the 6.9 mills that has been the strawman. But as I said in my previous article, I'm not willing to vote for a permanent levy of any size until we talk through the long-range fiscal strategy. An Emergency Levy with a duration of 2 years is a viable solution, in my opinion. That way, if we've been overly conservative with our assumptions, and end up needing less than projected, we have a chance to fix it when the emergency levy expires. So here's the punchline: If we can limit the growth rate of expenses to about 3% per year (it has been 5.2% since 2003), I estimate that an emergency levy would need to raise on the order of $18m/yr, which would fund operations and restore our cash balance back to $10 million by the end of FY13 (we are now large enough that the cost to meet one month's payroll exceeds $12 million). This would be the equivalent to 8 mills. But it would automatically expire in two years. During those two years, we'll gain greater knowledge of what the State funding picture looks like, and we'll have the time to have a serious conversation about our long term fiscal strategy, which is the same thing as saying our long-term compensation & benefits strategy. My analysis suggests that if we continue spending on the trajectory described in our Five Year Forecast, which implies an compound annual growth rate (CAGR) of 4.7%, we'll need to pass 11.5 mill levies every 3 years, or 8.5 mills every two years. That can't makes sense to anyone. So what if we held our spending growth to a CAGR of 3%? That would lower the levy need to 7.8 mills every 3 years, or 5.6 mills every two years. This is still a chunk of money - either choice would be equivalent to increasing our property taxes approximately 3.5% each year (5%/yr for the just the school tax portion). Even if we plan for zero spending growth for the next decade, we need a levy of 4 mills (1%) just to cover our current level of spending ($162m/yr), which is greater than our current income ($157m/yr). That would imply at minimum a total freeze on compensation and benefits for the next decade, as well as no new staff. As non-personnel costs might rise, staff (or pay rates) would have to be reduced to compensate. Others will say that we should just cut $5m/yr from our spending, then we'll be okay with the revenue we stream we already have. That can be done, but not without some tough decisions. I believe there is merit in discussing the idea Mike Harrold brought forward at the last meeting -- using an emergency levy as an interim step while we learn more what the State is going to do to us. It could be that our community would be willing to stomach a larger levy millage if they know it will expire in say 2 years. 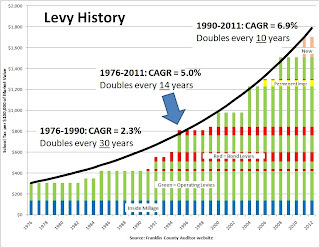 Of course, we would need to be very good at educating them about what happens when the levy expires - the next permanent levy would likely have to be large enough to replace the emergency levy and fund the CAGR [Compound Annual Growth Rate] of expenses. If this makes sense to you, please make your feelings known to the other members of the School Board as soon as possible. As always, I encourage and appreciate your comments here, that alone won't sway the other Board members to consider this excellent idea. A letter, an email, or your voice at the next Board meeting works significantly better. Thanks again to Mike Harrold. I hope this demonstrates that comments made in person at the Board meeting can indeed start the ball rolling. FYI - check out this cool tool one of the members of the Finance Committee for Olentangy Local Schools put together to help them understand and discuss various scenarios. He has offered to adapt the tool for our use as well.